�Bashudha Tomar Jonno Amar E Gaan� will be aired on Rtv tonight at 11:30 pm. Rathindra Nath Roy was one of most prominent performers of the Swadhin Bangla Betar Kendra. 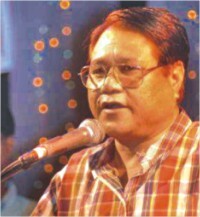 Roy has also done his bit to promote folk songs, especially Bhawaiya songs that are popular in the Rangpur area. Roy is also a playback singer and has won many awards like BACHSHASH (Bangladesh Cine Journalists Society) Award in 1979 and 1981, The Ekushey Padak in 1994 and the Popular Folk Song Award in the World Youth Festival in East Germany in 1973. Nath will be guest on rtv's phonomusical programme �Bashudha Tomar Jonno Amar E Gaan�. Apart from live conversation with the audience, Nath will also sing on request on the show. Tanif Mahmud is producer and Shayam is the host at the programme. The programme will be aired on Thursday at 11.30pm.